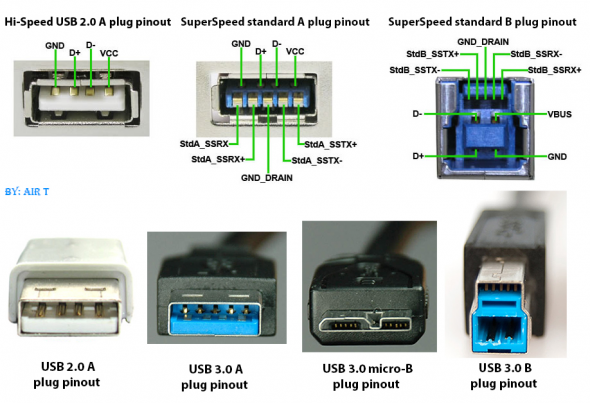 Sethioz Industries Official Blog: USB2 vs USB3 cables - Can I use USB2 cable for USB3 device? USB2 vs USB3 cables - Can I use USB2 cable for USB3 device? USB - Universal Serial Bus is most common cable type nowdays, well at least in computing it is. There's a question i had myself while ago. We should all know that USB3 (5000mbit/s) devices are about 10 times faster than USB2 (480mbit/s), but is there any difference in a cable? YES, there is difference in cable. if you connect USB 3 device using USB2 cable, then your device will not have USB3 speed, it will be considered as USB2. It works fine, so lot of people may get confused and say "it works"!. Yes it works, but it will not give you USB3 speed. I tested this out with my External USB3 HDD, it pulls the speeds of 200mb/s read and write with USB3 cable, then i connected a small USB2 extension cable between HDD and PC and speed dropped to 40mb/s. But you said 10 times faster?! ..yes USB3 is capable for such speeds, but HDD isn't! Meaning that 200mb/s is HDDs max speed, that was just test to see if USB2 cable gives USB3 speed for USB3 devices and it didn't. If you don't have USB3 (most PCs nowdays have it), then you can still use USB3 devices, but they'll be slow and far from their potential. I have tested Leap Motion using USB2 cable and it works, but it's sluggish and laggy. so if your PC does not have USB3 port, then you should buy USB3 adapter/card, you can grab one for very cheap on eBay (just search for "USB3 card" or "USB3 adapter"), they're usually for PCI-E slots. Here's also a picture of USB connectors and their layouts, as you can see below, USB3 has more wires, so USB2 can never act as USB3, but USB3 can always be used for USB2 devices, in other words, it's backwards compatible.